Sodium Hydrosulfite Market Size was estimated over USD 1 billion in 2016 and the industry will likely grow by a CAGR of about 4% up to 2024. The rising paper products demand in Asia Pacific will drive the global sodium hydrosulfite market growth till 2024 owing to its extensive application as a reductive bleaching agent for pulp in the paper manufacturing process. In 2016, Asia Pacific accounted for more than 45% of the worldwide paper production and is a major regional market for the paper industry. The demand for paper products in Asia Pacific in 2016 was over 220 million tons and is anticipated to surpass 350 million tons in 2024.This will boost the product demand and propel the global sodium hydrosulfite market during the forecast timeframe. Majority of the paper products demand is from the packaging industry, which has been flourishing at a healthy rate since the last decade, owing to the rising popularity of the e-commerce sector. Increasing use of computers have also led to a growing demand for printing and writing paper, which is expected to offset the gradual decline of demand for paper in the newsprint sector. Easy availability of raw material, low labor cost and the presence of many paper & pulp manufacturers will propel the paper products industry in Asia Pacific, which will further augment the global sodium hydrosulfite market during the forecast timeframe. The gradual decline of paper & paper board production capacity in North America may negatively impact the global sodium hydrosulfite market growth during the forecast timespan. This decline in production capacity can be chiefly attributed to increasing digitalization in the region, which has led to decrease in paper and paper products demand. The production capacity of paper & paper board in North America was 79.6 million tons in 2016 and will likely decrease to around 70 million tons by 2024. Global sodium hydrosulfite market will also be affected by decreasing paper & paper board production capacity in Western Europe, which was over 88.2 million tons in 2016 and is set to decline to less than 80 million tons in 2024. High labor cost in North America and Europe has led local manufacturers to lose their cost competitiveness to their counterparts in developing countries. Major paper producers in North America and Europe have reduced their production capacities or shut down some of their production units due to declining demand. This trend will likely hamper the regional market growth in the coming years. Based on process, sodium hydrosulfite market can be segmented into three categories including zinc process, sodium formate process and other processes including the borol process, sodium bisulfate process, etc. The zinc based process involves reaction of zinc dust with sulfur dioxide and converting the resultant zinc salt to sodium hydrosulfite in the presence of caustic soda or soda ash. This process segment has a significant share of sodium hydrosulfite industry and is expected to hold sway till 2024. Sodium formate process segment also has a substantial share of overall sodium hydrosulfite market and is expected to grow till 2024 due to rising popularity of this process. It involves the reaction of caustic soda and sulfur dioxide with sodium formate in a methanol solution. 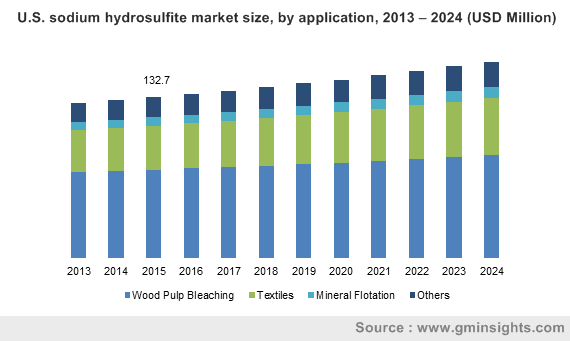 The sodium hydrosulfite market is categorized into four major segments including wood pulp bleaching, mineral flotation, textile, and other applications such as kaolin clay, chemical industry, food additive, leather, water treatment, etc. Wood pulp bleaching has a significant market share and is anticipated to grow at a steady rate during the forecast timeframe. Increasing wood pulp demand in paper packaging industry will propel this growth. Mineral flotation also has a substantial share of sodium hydrosulfite market and this segment is expected to gain till 2024. The product is employed in the flotation of coal and pyrite and is also used in molybdenum mining to separate copper, lead, and zinc ores. North America held around 15% of the overall sodium hydrosulfite market in 2016 and the region will likely witness a slow growth of around 2% CAGR till 2024. Europe, on the other hand, generated more than USD 100 million for the overall market in 2016 and will exhibit growth at less than 1.5% CAGR in the forecast spell. The major chunk of the product demand in North America and Europe is from wood pulp bleaching and decreasing demand for paper products coupled with declining production capacity of paper manufacturers will lead to a sluggish growth for the sodium hydrosulfite market. Sodium hydrosulfite market is moderately consolidated with top four players accounting for a substantial portion of the overall industry. Guangdong ZhongCheng Chemicals Inc., AZ Chemicals, Inc., BASF SE, and Jinhe Group are the top players in the industry. Other manufacturers in the market include Bruggemann Chemical, Chemtrade Logistics, Mitsubishi Gas Chemical Company, TCP Limited, Royce International Corp, Montgomery Chemicals, Tokyo Chemical Industry, Sigma-Aldrich, Finetech Industry Limited, Alfa Chemistry, and Angene Chemical. Some manufacturers such as BASF SE, Jinhe Group, and Chemtrade have integrated their operations and manufactures raw materials as well as the product. Sodium hydrosulfite, also known as sodium dithionite, is mostly employed as a bleaching and reducing agent in various applications. It is also used as a cleaning & stripping agent and as a food additive. There are several grades of the product manufactured through different processes. Manufacturing processes vary according to the manufacturer, availability of raw material and scale of production. Rising demand for paper & paper board from the packaging industry will drive the demand of the product. Growth in the textile industry will also contribute to the sodium hydrosulfite market as the product is extensively used in textile bleaching process.